Les Blues, assisted by some contentious officiating decisions, proved to be too strong for the Vatreni in the summit clash. 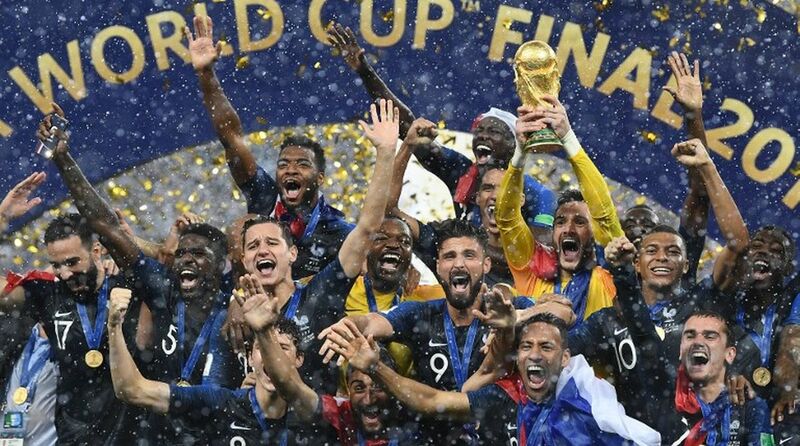 France’s big guns—Antoine Griezmann, Paul Pogba and Kylian Mbappe—all fired when it mattered the most as Les Blues thumped Croatia 4-2 in the 2018 FIFA World Cup Final at the Luzhniki Stadium on Sunday night. There was controversy galore, and how could it not with France in the final after all, but not of the headbutt kind. Mario Mandzukic’s own goal had given Didier Deschamps’men the lead in the 18th minute itself, but Croatia didn’t take long to level proceedings. After beating off the likes of Argentina and England, among many others, the Vatreni know a thing or two about punching above their weight and Ivan Perisic scored a golazo worthy of winning the World Cup to equalise for the tiny European nation in the 28th minute. Then, came perhaps the defining moment of the clash. France had a corner and Blaise Matuidi’s downward header came off Ivan Perisic’s hand to go out of play. With the French player frantically appealing for handball, referee Nestor Pitana consulted VAR and after a brief pause, awarded Les Blues the penalty. By the rules of the game, it was a hand but Perisic definitely didn’t know anything about it as he was just jumping for the ball. Griezmann stepped up and cooly send Danijel Subasic the wrong way to restore France’s one-goal lead seven minutes from the interval. Croatia were dominating the possession stats, but with Deschamps’ side defending deep, they were finding it difficult to make inroads. At the restart, the tie was very much in the balance but as the match progressed, France’s superior quality began to assert itself. Perhaps, after playing three extra-time matches in a row, fatigue was taking its toll on Luka Modric and Co. but we will probably never know. As it was, Pogba finally broke his duck of not performing in a final as he took advantage of some slack Croatian defending to fire home with his left foot a minute from the hour mark. And barely six minutes later, all doubts were quelled as Kylian Mbappe’s low shot from outside the box beat Subasic. The 19-year-old, who has already lit up the tournament, became only the second teenager after Pele to score in a World Cup Final and his goal effectively killed of Croatia’s chances on the night. Skipper Hugo Lloris had a moment to forget when he allowed Perisic to close him down right on the goal line and while Croatia had some hope, it was a pipe dream in the end as France simply shut up shop and held out for their second World Cup title overall and first on foreign soil. History for Didier Deschamps as well, as he became only the third man to lift the World Cup as a player and manager. Exactly two decades after he clinched his first title for Les Blues, he found himself tasting glory once again.